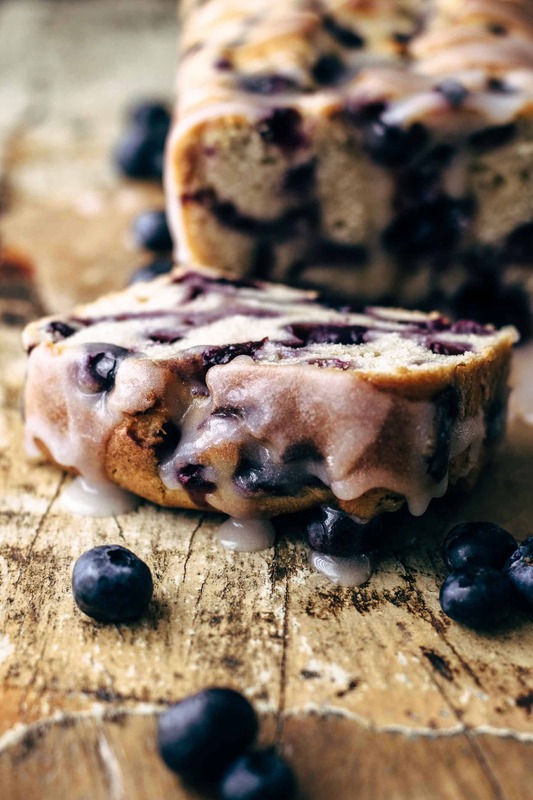 This easy Blueberry Bread recipe is made in just 10 minutes and requires 9 ingredients. It is super soft and moist because of added sour cream and brown sugar. 2 cups of blueberries make sure that this Blueberry Bread deserves its name. Breakfast time! Or dessert time? 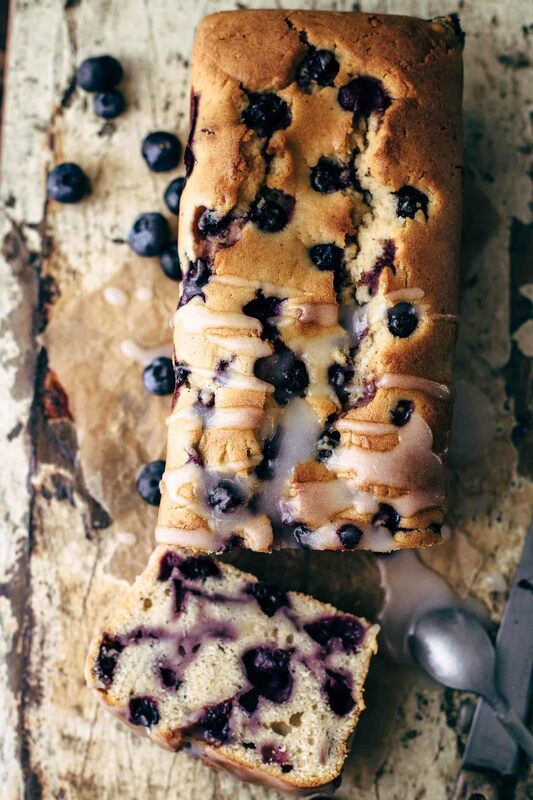 However, this delicious Blueberry Bread is the right choice for both, breakfast and dessert. 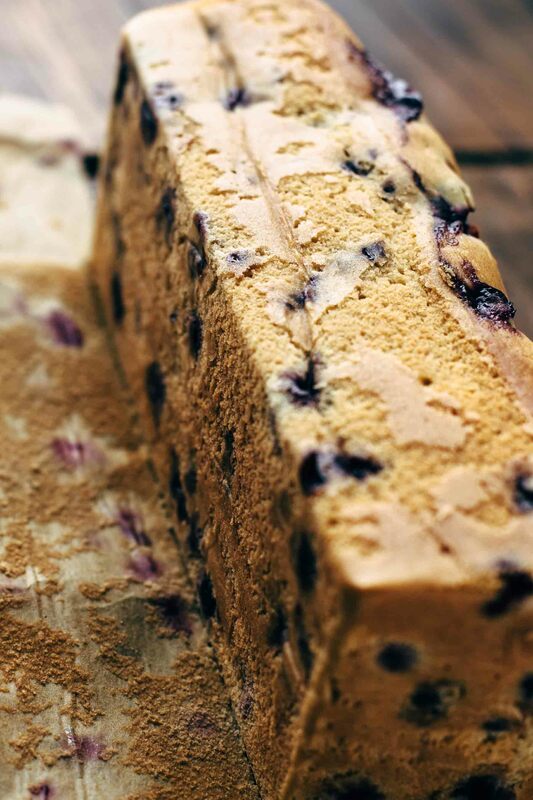 Soft, moist and loaded with blueberries. You will think you eat a huge blueberry muffin in a loaf shape. 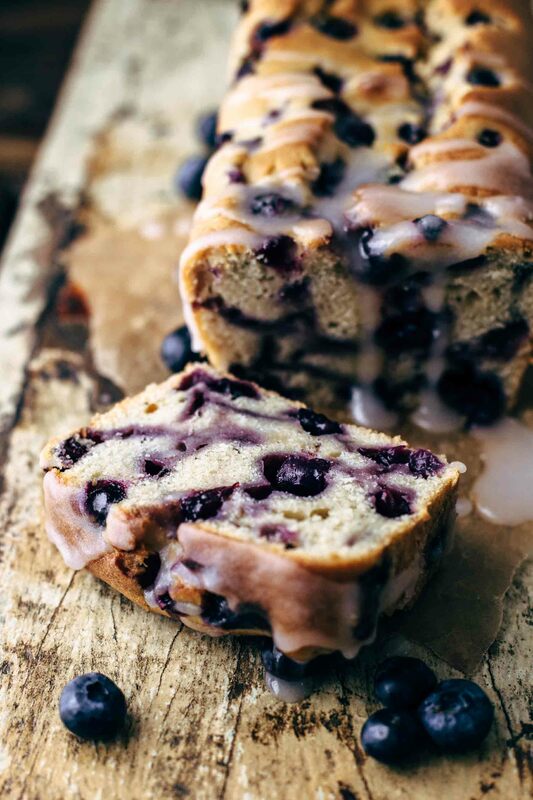 I used brown sugar for the flavor and sour cream to have a super moist and soft Blueberry Bread. The texture is just great. 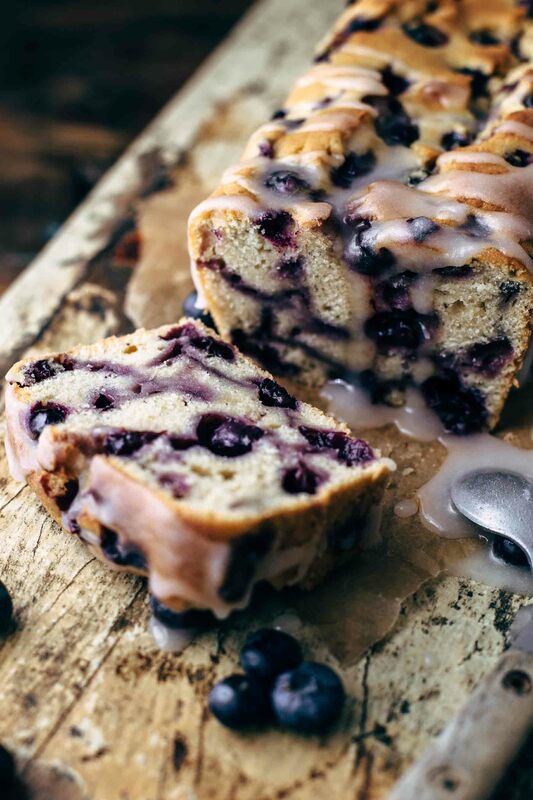 Why is this Easy Blueberry Bread Recipe so awesome? By the way, how did you spent the Easter holidays? Were you also feasting on chocolate eggs and tons of sweets? Even if my pants are like a second skin today, I don’t regret anything. The holidays were so relaxing that I charged my batteries completely. It’s sometimes hard studying, working, and being self-employed all at the same time. Some days are very exhausting. Blogging is not that easy when you want to make a living out of it. Treat it like a hobby, and it will always be one. It’s a lot of work and success doesn’t happen overnight. You have to love it. Otherwise, it’s hard not to give up. And I do. I really, really love it. I love to share all my recipes with you. Thank you so much, for following along and thank you for all the lovely comments and emails I receive from you. It always makes me happy to read that you made a recipe of mine and it turned out great and you and your family loved it. Last time a dear Instagram friend shared a story of her and her kiddos baking my Banana Coconut Bread. It touched me deeply to see this cute family how they baked together and had so much fun. This means so much to me. Ok back to the today’s recipe. Add sugar and mix until creamy. Alternately add dry ingredients and sour cream. Starting and ending with dry ingredients. See? Very easy like I said. I drizzled my Blueberry Bread with sugar icing before serving. It fits perfectly with the Blueberry Bread, but it’s up to your preference if you want to use it as well. It’s also delicious to have it warm with a bit of butter and maple syrup on top. If you want to drizzle it with sugar icing and have no recipe for a sugar icing on hand, then mix together 1/2 cup of sifted powdered sugar with 1 tbsp of milk. This will be enough for one Blueberry Bread. Or did you ever think of smearing Nutella on top? No? You miss something. Blueberry and Nutella is an undiscovered dream combination. Trust me on this. 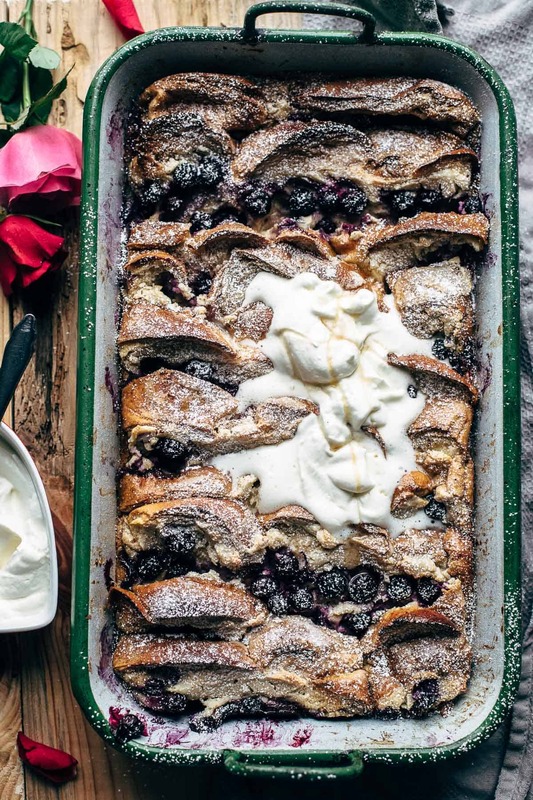 You are still thinking of smearing Nutella on this Blueberry Bread, don’t you? 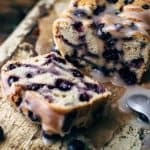 If you make this easy Blueberry Bread recipe, leave a comment, rate it and tag a photo #alsothecrumbsplease on Instagram! Would love to see your snap! 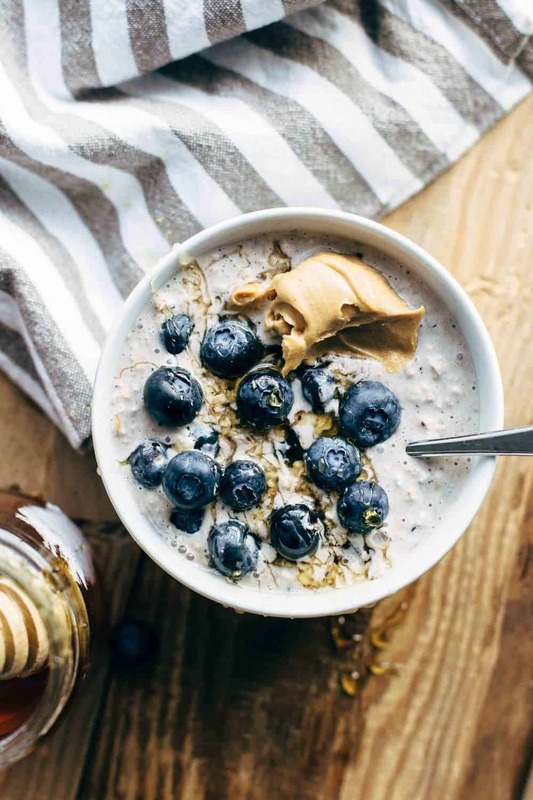 You may also like Blueberry Cream Cheese French Toast Bake, Blueberry Peanut Butter Pancakes, Blueberry Cheesecake Muffins, Blueberry Cream Cheese Overnight Oats, or click here to see all recipes. Preheat oven to 350°F (175°C). Line a 9x5“ (23x13cm) loaf pan with parchment paper with an overhang on two opposite sides to easily lift the bread out of the pan after baking. Set aside. In a small bowl sift together flour, baking powder, and salt. Set aside. In a large bowl using a stand or handheld mixer fitted with a whisk or paddle attachment beat butter until soft. Add sugar and mix until light and creamy for about 2 minutes. Add eggs and vanilla* and mix until well combined. Alternately, add dry ingredients and sour cream and stir on low speed to combine. Begin and end with dry ingredients. Fold in blueberries. Transfer to the prepared pan and bake for about 55-65 minutes, until a toothpick inserted in the center comes out clean. Let cool in the pan for 10 minutes then transfer with the paper to a wire rack and let cool to room temperature. Drizzle with sugar icing before serving, if desired. Store leftovers in an airtight container at room temperature up to 3 days. This bread looks amazing! Gotta try this one! Thank you so much, Karly. 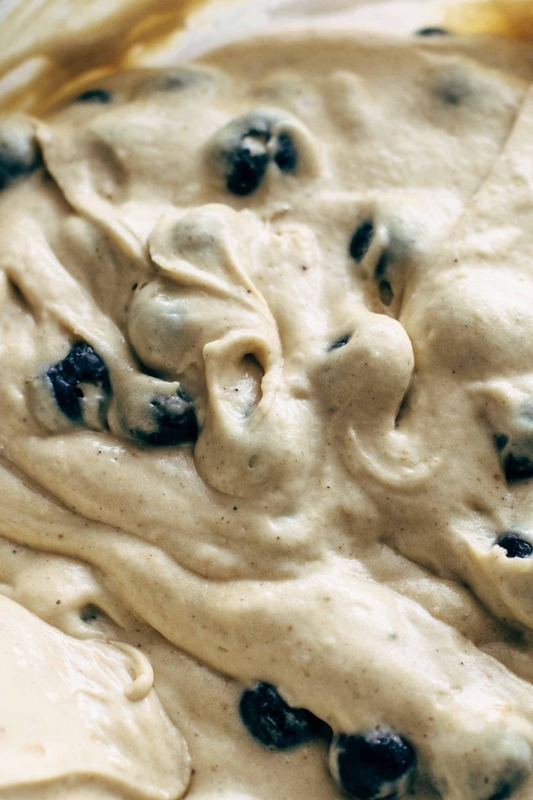 It is super soft, easy and quick to make, and oh so blueberry-ish. Try it and you will love it. Confession, this did not prove to be particularly easy for me…think it took me well over 30 minutes the prep. Then I had to bake it for over and hour and it pretty much fell apart ???? BUT oh the flavor is OH SO GOOD! I will try again for sure! The preparation time is sure depending on the experience level but 30 minutes seems to be very long for this recipe. I can’t say for sure what went wrong but when you say it fell apart, do you mean it was crumbly and dry? I see just two possibilities for too dry bread: 1. Maybe you used too much flour. The best thing is to spoon and level the flour in the measuring cup. 2. It baked too long. Maybe check after 50 minutes the first time with a toothpick. I am sorry, but this bread is horrible! Brown sugar? No way. Needs one more egg, and only 1 cup blueberries. I made this recipe,twice, followed it exactly as written and both times I ended up with a mushy, flat loaf. Made a similar recipe that added one more egg, used white sugar, and 1 cup blueberries and it is delicious! 2 cups fruit in your current recipe weighs it down and creates mush due to too much liquid from the fruit…no matter if you use fresh, canned (drained) or frozen. And brown sugar is just yuck in this. I’m sorry to hear that you don’t like this recipe. Fortunately, you found a recipe that fits your taste. The amount of eggs or other wet ingredients is depending on the amount of dry ingredients. You will find different blueberry bread recipes which have 1-4 eggs or also 1-2 cups blueberries but they all have different amounts of dry ingredients. Hi, I’d love to try this recipe tomorrow but I’d rather now use sour cream. Is there something I can replace it with? Yoghurt perhaps? Ps: i LOOOOVE your blog!!! We are addicted to this bread! It’s so delicious and we love how much blueberries are in it. Highly recommended! I’m happy that you like it, Anna! Thank you so much! Love this recipe. I have made it many times! Thank you so much, Sara! I’m beyond happy that you like it! Have a wonderful day!